Advertising on Yelp has the potential to bring more exposure to your Yelp business page. When you create an ad on Yelp it doesn’t just appear on the site’s desktop platform; it also shows up on its mobile website and on the app. The following features are available for any business. However, Yelp has two ad service offerings that cater to business with 1-10 locations or those with more than 10 locations. As far as we can tell, the only difference between the two packages is that those with more than 10 locations can get additional help from Yelp’s Support team. The most common ads on Yelp are target ads, which appear whenever you search for businesses. Target ads show up above the actual list of search results with the “Ad” designation in front of the business name. Aside from the “Ad” in front of the name, these ads are meant to look like a natural part of the search results. They fit in the same or similar Yelp Business category as your search term and feature attractive images, rave reviews, and vital contact information. Click on the “Yelp Ads” section. You can find it within your account on the Yelp for Business Owners website. You can activate or stop these target ads at any time. Check out the preview of your ad. By default, the ad will include the business name, contact information, a photo, categories, overall rating, and a snippet of a review. You can choose to write a brief description of the business’ specialties, which appears on the ad only if you don’t have enough reviews on your page. Click the “Continue” button on the bottom of the page when you’re satisfied with its presentation. Set your ad budget. Yelp provides three ad budgets, which shows the average daily cost-per-click and estimated clicks per month. These can change frequently depending on your category’s popularity and general location. You can also choose to set your own daily budget. Keep in mind that you’re only charged when someone clicks on the ad. Opt-in to the Enhanced Profile upgrade. You can decide whether or not to check this box to upgrade the business’ page. 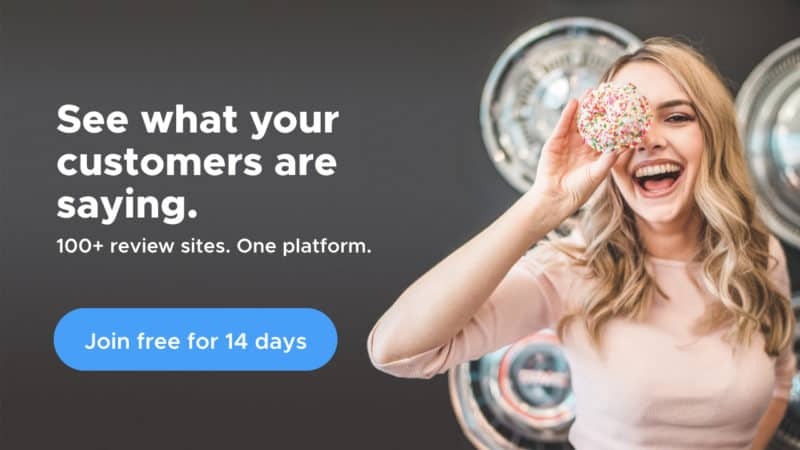 With an Enhanced Profile, you can add a Call to Action button, customize the order of the photos on the page, and most importantly, remove the competitor ads that might appear on your page. The cost to upgrade is measured on a daily basis. Click “Continue” below the upgrade when you’re ready to move to the final step. Finalize your ad order. You’ll see the grand total of your ad options, and you can edit your choices if necessary. Fill in your billing information and agree to the Yelp Ads and Upgrades terms before clicking the “Purchase” button. Once it’s live, you can see the final version of the ad in the “Yelp Ads” section of your Yelp business account. Clicking on the “Customize Ad” option above your ad allows you to tweak a few elements in its presentation. This includes the ability to change the featured image or add your own text in lieu of a review snippet. You can also use the “Distance Targeting” option to change the overall geographic reach of your ad for those searching in the local area. The reason why you are only charged for each click on your ad is because of the way Yelp distributes the many ads available on the platform. This is heavily dependant on a user’s search keyword and location. For example, let’s say that you created an ad for a ramen restaurant in Chicago. A Yelp user in the city then looks for restaurants in that category in the Chicago area. Yelp will then scour its database to find ads that not only are a close match to the category or keyword but are also in the local area. Chances are that you’re not the only place in town that has an ad for their ramen shop. Yelp will compare your ad to similar ads in the area. Along with other hidden factors from the user, your business, and the competition, Yelp then comes up with an estimated “click-through rate,” which shows the likelihood that someone will visit your listing. Yelp multiplies that click-through rate by the bid amount you set to get an ad ranking score. The ad with the highest ad ranking score wins and shows up above the search results for ramen shops in Chicago. However, keep in mind that you only have to pay for that winning ad if someone clicks on it. Even then, you might not have to pay the full price that you set for that bid; just the amount necessary to beat the ranking score of other competing ads. Because this amount can fluctuate on a daily basis, your best bet for an effective ad is to set up a monthly budget. Yelp will then use that pool of money to determine the best bid amount every day. 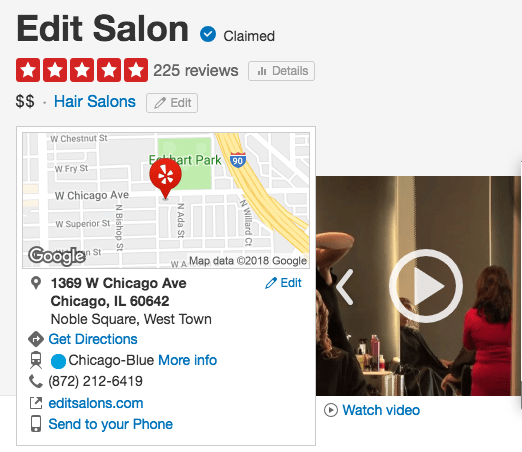 One way to drive purchases from potential customers who are already on your Yelp page is through a Call to Action (CTA) prompt, which comes as part of the Enhanced Profile upgrade. You can use CTAs to provide coupons, link to order forms, or create new leads to a business’ website. Click on the “Call to Action” section. This is located on your Yelp for Business Owners account. Click the “Get Started” button to start the process. Create your mobile CTA. You will need to choose a specific action for the CTA from the dropdown menu. You’ll also write a brief description, additional information, a target URL for the action, and the end date for the CTA’s run. You’ll see a preview of the CTA at the top of the page. When you’re done, hit the “Save and Continue” button. Create your desktop CTA. The setup process is similar to a mobile CTA except for the fact that this doesn’t have an “Additional Information” text field in it. Click on the “Save and Continue” button to finish the process. Wait for Yelp’s verdict. Before your CTA goes live, Yelp’s moderating team will look at it to make sure it meets the site’s guidelines. The process takes two to three days, and Yelp will send you an email to notify you when the CTA is approved and live on your page. You can edit any ongoing CTAs by going to the “Call to Action” page. However, keep in mind that any changes you make will have to go through Yelp’s moderating again before it goes up on the listing. Pick an action that you value most, but it should be an action that doesn’t already exist on the business page. Make the button text engaging, but also as broad as possible. For mobile CTAs, add more context in the description to further entice users. Another way to drive purchases on your page is by creating Yelp Deals or Gift Certificates. Discounts or special offers can get people into your business, but make sure that each offer is carefully worded so that people only use it for specific products or services or don’t combine it with other ongoing promotions. Click the “Set up Deals and Gift Certificates” button. You’ll find this within the “Deals and Gift Certificates” section. Select specifics for the Deal. Choose the number of vouchers for the deal, create a set price, and add any special terms and conditions that go along with the deal. The photos used in the Deal are picked by Yelp, and you won’t be able to change them. Agree to Yelp’s Merchant Terms. Your Deal won’t be available to customers if you don’t agree to the terms. Publish the link. Click on the “Post this Deal” button. Click the “Add Gift Certificates” button. This is in the “Deals and Gift Certificates” section. Select specifics for the certificate. You will choose the price included in the certificate as well as the result of unused balances. Review and agree to Yelp’s Merchant Terms. Click the “Post this Deal” button to publish the link. If a customer at your business redeems a Deal on the Yelp app, you’ll need to confirm the Deal’s terms and then tap the “Mark as Used” button on the customer’s app. Go to the “Purchases” tab. This is in the “Deals and Gift Certificates” section on your business account. Enter the six-character code. Put the code in the “Claim code” text field. Click the “Redeem” button. This will confirm the Deal. Redeeming the Deal as soon as possible on the business’s end is important, especially if the customer disputes a refund issue. In this case, Yelp will first check if the Deal was already redeemed before the refund was requested. You can also reject a Deal presented by a customer if you find that they didn’t follow the terms and conditions you dictated for that offer. Any further issues on this case should be directed to the Yelp support team. The profits earned from these promotions are processed on the fifteenth of every month. The money is then sent to the address listed in the “Payouts” tab of the “Deals and Gift Certificates section.” You can click on the “Edit payout information” link on the page to change the address. You can also click on the “Request payment” button on the same page to get the payments sent on a day outside of Yelp’s monthly delivery schedule. This request will take up to 10 days for processing in addition to the actual delivery time. Any profit earned from Deals and Gift Certificates that exceeds $599 for the year will require Yelp to send you tax forms before you get the money. The form asks for a Social Security Number or Employer Identification Number, which you can enter in the “Billing” section in your Yelp business account. Add or update your Social Security Number or Employee Identification Number. Confirm your address information. When you’re done click on the “Save tax information” button to finalize your entries. In addition to images, businesses can also add a “featured video” on their page, which is another add-on to your Yelp Ads package. There are two options for creating the video content: make it yourself or get help from Yelp. If you do make your own video, you’ll need to make sure that the final product is less than two minutes long. The file you send to Yelp must also be less than 500 MB and is in one of the following file formats. Those who opt for a Yelp-produced video can get in touch with one of the two vendors below for information and questions about pricing. Keep in mind that any footage created through this process is technically owned by Yelp so you can’t embed the video on social media or on the business’ non-Yelp site. You can see a majority of the ad performance data in the “Yelp Ads” section of your Yelp business account. A bar below your ongoing target ad will show how much of your monthly budget is already used for the month. It also tells you the number of clicks on the ad and the average cost per click. For a larger overview, you can look at the “Historical Metrics” data below the budget graph. This shows the overall clicks and impressions received over the last 30 days, the current or previous month, the last 12 months, or even for the current year. You can get even more additional insights on the data in the table below the “Historical Metrics” data. 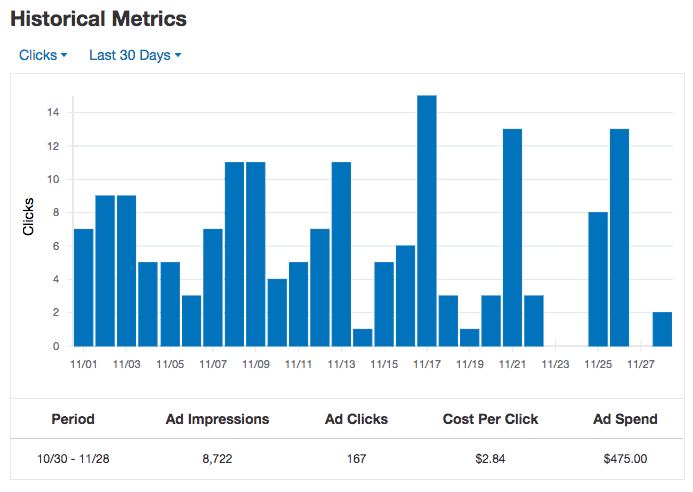 This shows data on ad impressions, clicks, cost per click, and overall ad spend over the custom time range you selected in the “Historical Metrics” graph.